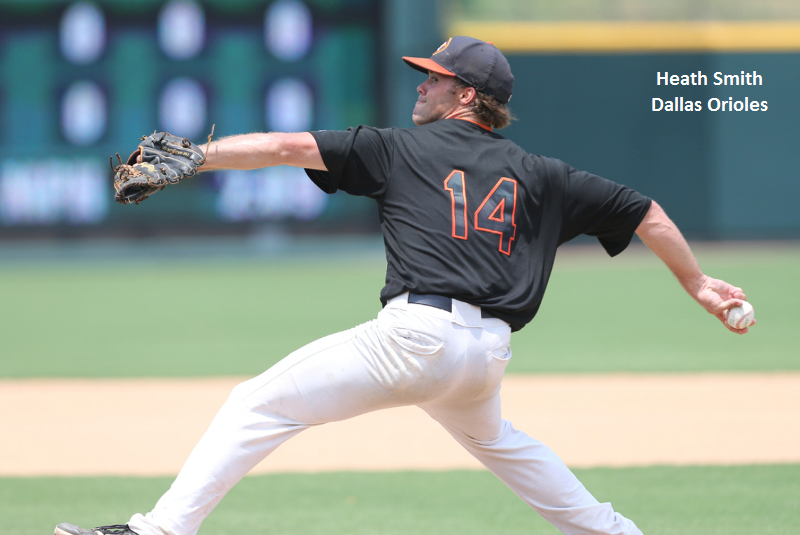 (July 24, 2018 – Dallas, TX) In a match-up of contenders in the Open American League of the North Texas Amateur Baseball League (NTABL), Heath Smith of the Dallas Orioles completely dominated American Made by pitching a complete-game performance that included 16 strikeouts in temperatures well over 100 degrees. Many leagues around the country see varying states of Mother Nature, but when you combine that with the predominance of turf fields in the state of Texas, things can become extreme and extremely challenging when temperatures hit between 110 and 120 degrees. As it would turn out, the only thing on fire on this scorching Sunday in Texas was Smith’s arm. Smith was busy playing softball with a local league in Dallas when a teammate of his told him about this baseball team he was playing on and asked if he’d like to try playing baseball game. Baseball? Guys still play, like, hardball? Yes! And thanks to organizations like MSBL and the NTABL, opportunity presented itself for Heath to get involved like so many of us have figured out. Smith started on the mound about a week later and won in impressive fashion, going on to strike out 10 in his first performance during a 5-2 win for the Orioles. In his third start with the team, Smith proceeded to really put on a show. Striking out at least one batter per inning, Smith dominated the American Made squad on the heat-singed turf. Smith went the distance, allowing just five singles while also giving up two walks. After allowing an unearned run in the fifth inning of the game, he proceeded to rebound and strike out the side during the sixth. After the score was tied again the seventh, he only gave up two bloop singles the rest of the way and completely shut down the American Made offense. His teammates helped him out by scoring three times in the top of the eighth to put the game out of reach and to help seal the 5-2 victory. Since the big game, Smith went on to receive votes to the NTABL Charity All-Star Games held at Dr. Pepper Ballpark in Frisco, TX. He was named the starting pitcher for the East All-Stars and gave up an unearned run in 2 innings of work, while adding a 2-RBI double to help lead the East All-Stars on their way to victory. Smith was named MVP following the game. As the regular season closed off, Smith once again faced American Made in the playoffs and took the tough luck loss 1-0, giving up an unearned run in the bottom of the first on an errant throw from the team’s catcher. Smith gave up four hits while striking out 13 in eight innings in his 115 pitch effort.